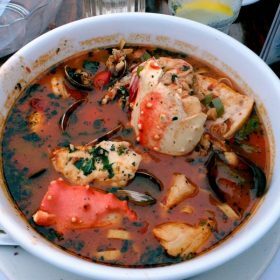 Considered mainly as an Italian-American variant of the many fish and seafood stews in Italian cuisine, cioppino is also quite a popular dish for the holiday season, especially the Feast of the Seven Fishes. This is probably because you can combine several fish and seafood in the dish, shortening the quota for the number of dishes you need to prepare for the occasion. Unlike most of the Feast of the Seven Fishes dishes, this one is not a traditional Italian recipe per se. But it was created by Italian immigrants. Basically, it’s sort of a smorgasbord or buffet of excellent seafood all in one glorious pot of savory stew. What makes it one of the best seafood dishes around is that it uses only the fresh “fruits of the sea”, in other words, freshly caught seafood. The epitome of Italian-American cuisine, it’s essential to only use the freshest ingredients possible. This is why it is best you should only buy the “catch of the day”, for lack of a better term. According to some, this dish was created during the 19th century, when Italian immigrants, most of whom came from Genoa, settled in North Beach, San Francisco. Originally, its main ingredients were whatever the catch of the day were. This often included crabs, shrimps, various fish and shellfish that came from the Pacific Ocean. The name of the dish comes from the classic seafood soup from the Liguria region called ciuppin, which is somewhat similar to cioppino, only without the tomato sauce. It may have some tomatoes, but considerably fewer than in cioppino. Aside from that, there are also a couple of traditional Italian soups that bears some resemblance to this dish. One is the brodetto di pesce from the Abruzzo region while the other one is the cacciucco from the Tuscany region. 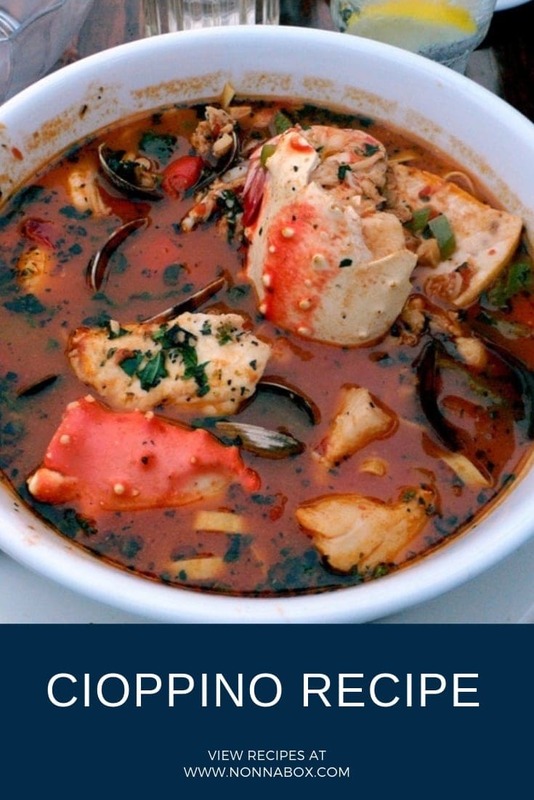 This recipe usually consists of crustaceans, shellfish, squid, and all kinds of saltwater fish. And to make the dining experience more complete and even more savory, refer below the recipe for some serving and wine pairing suggestions. If you like seafood you must try this recipe. Made with shellfish and with fish is the perfect soup for your meal. In a saucepan, put extra virgin olive oil and fry the fennel, garlic, and onion in medium heat. Sauté for a few minutes until ingredients are soft. Add the tomato sauce and bay leaves, and simmer for about 10 minutes. Add the white wine and a cup of fish stock. Put the diced fish and prawns and cook for about 15 minutes over medium heat. Add salt and pepper to taste. In another saucepan, sauté the shellfish in oil and garlic. Add parsley, pepper, and 1 cup of fish stock. Simmer until most of the shells open up. Throw away the shells that don't open up. Set aside. In the previous saucepan, add the cooked shellfish along with the fish stock. Simmer for about 5 more minutes. Add the chopped parsley, and some salt and pepper, to taste. If you have crabs or lobsters, cook them with the shellfish and simmer for about 15 minutes. 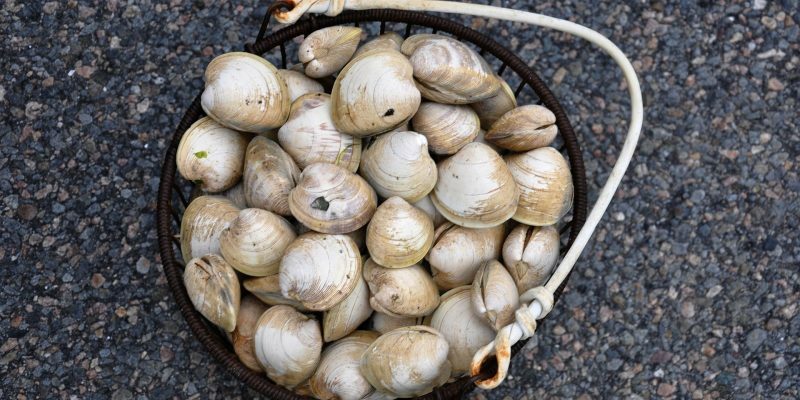 When you’re cooking shellfish, inspect the cooked shells to check if any are unopened. If there are indeed any, make sure to throw those away because they are not fit for human consumption. You can also use a combination of diced Italian tomatoes and tomato paste, instead of simple tomato sauce. You will then have a thicker soup base but still with the same delicious outcome. This dish is best served with slices of yummy Italian bread. So while the dish is simmering, slice a loaf of Italian bread. And when the dish is done, put them on top of the bowls as you serve the soup. Aside from onions and fennel, you can also add shallots to the mix of vegetables in Cioppino. 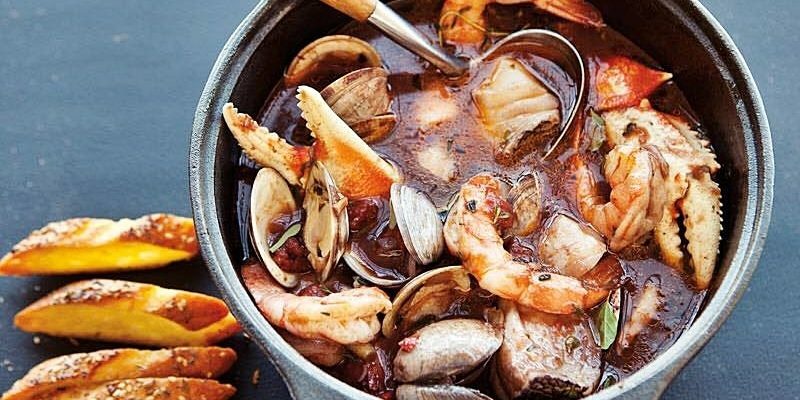 Much like many Italian stews or thick soups, this dish is best served with some make the dish even more savory, serve cioppino with slices of toasted bread. The bread is to be dipped in the flavorful sauce. You can use sourdough or some classic Italian bread. As long as it’s delightfully spongy enough to hold as much of the savory stew, then it’s good to go. If you want, you could also take it up a notch and prepare some deliciously aromatic garlic bread for it. If you want some tips on how to make the perfect garlic bread, or other versions of it, check out our Garlic Bread recipes. Now, an Italian dinner will not be complete, of course, without the perfect wine pairing for it. For this seafood dish, culinary experts have quite a diverse list of wine suggestions. Since it’s a seafood dish, you may say that the typical choice would be a bottle of Pinot Grigio or sparkling white wine such as Prosecco, Moscato, or perhaps Lambrusco. However, since cioppino also has a higher acidity content than other seafood stew because of the tomatoes, then other great wine options for it would be a bottle of Italian red wine such as Chianti or Sangiovese. If you’re finding it hard to decide which type of wine to pick, red or white, then your best bet is to simply buy a bottle of each. And if you’re serving it in a dinner party for friends and family, just ask them which wine they’d prefer. That way, you’ve got all your bases covered. 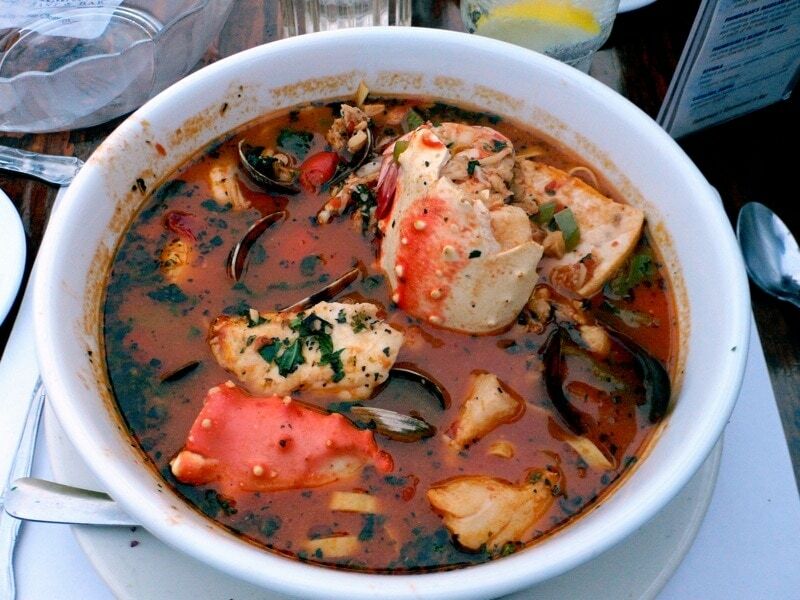 This savory seafood stew is the best! Combine it with garlic bread and wine and it’s perfect for dinner like we do at least once a week while hanging out with friends.